Mixmag has partnered with music and artist discovery app, WAV, to unearth and nurture emerging talent in dance music. MAGNIFIED is our flagship series, designed to elevate the world's best new electronic music artists through unrivaled support from both Mixmag and WAV. And you could be part of the program! Start by downloading the app below. Find out more about MAGNIFIED here. Sign up is easy. Benefits are huge. WAV is an artist-first music and video platform, built to empower creators and inspire fans. WAV lets fans discover brand-new artists, live streams, original series, curated playlists, and more. If you’re an artist, WAV makes it easy for your content to be seen and heard with our dynamic platform and unique profile pages that can be shared and linked. As an artist, why should I join WAV? WAV is a one-stop shop where you can upload your music, live stream your shows, build an audience, and interact with fans in real time. WAV is always on the lookout for top talent, and the more fans engage with your content, the more access you’ll have to WAV’s production, marketing, and label resources. Did we mention fans can support you directly through digital gifts? That too. 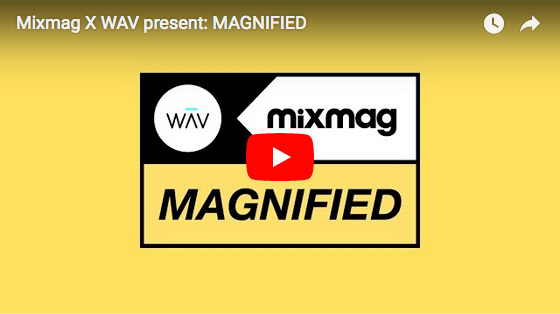 MAGNIFIED is WAV and Mixmag's flagship series, designed to elevate the world's best new electronic music artists through unrivaled support from both Mixmag and WAV. How do I become a MAGNIFIED artist? Then just start uploading content – including mixes, tracks, videos and more – for the public and the Mixmag and WAV team of experts to see. Anyone can join WAV, no matter if you’re an artist, fan, or casual listener. Do I need to be with a label? Nope. WAV is dedicated to supporting emerging artists. You can join as an independent artist or as a signed artist with a label, distributor, or publisher. Does joining WAV keep me from distributing my content on other platforms like YouTube, Facebook, Soundcloud, or iTunes? Not at all. You can use WAV on a non-exclusive basis, so you are free to use other platforms for your content. I’m not an artist, can I join WAV anyway? Absolutely. Your next favorite artist is ready and waiting to be discovered. Ready to rabbit-hole? You can check out curated selections from Mixmag, OWSLA, and Dirtybird, as well as provocative original series, featuring Carl Craig, Danny Daze, Wax Motif, Migos, 21 Savage, Sonny Digital, Ghostface Killah, and Skrillex. Do my music videos need to be exclusive to your platform in order to get your attention? No. Great music, strong hustle, and engaged fans get our attention. Does WAV make money off my video streams? The only revenue WAV makes is through in-app purchases. We split the earnings, returning 70% back to our artist partners. Other than that, we do not generate revenue via ads, etc. Yes! Your artist profile page is not only a hub for your music and video content, but it gives you access to all of your insights in one place.